Hi, everyone! 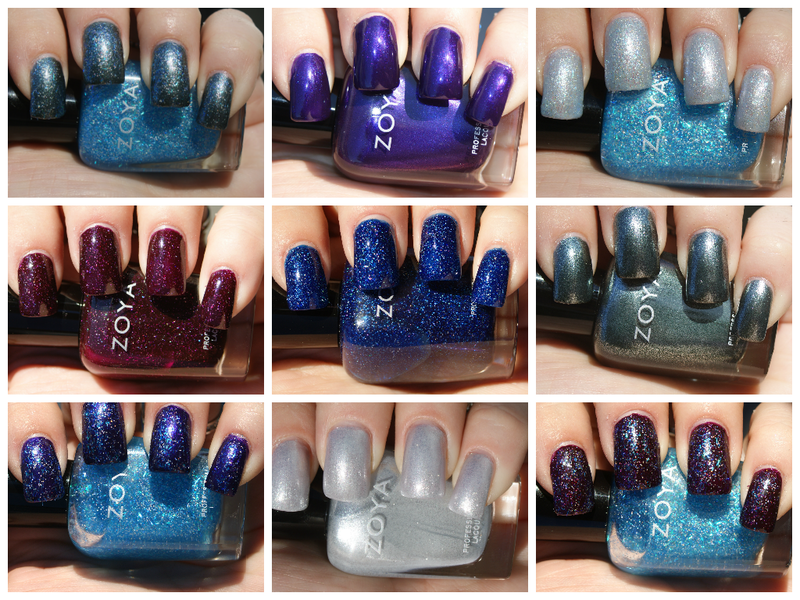 I'm super excited to bring you the Zoya Zenith Collection, Zoya's newest collection for Winter 2013, today! It came in my mail this morning and by 4:30pm, these babies were swatched and you are NOT going to be disappointed! First up is Zoya Seraphina! Seraphina is a metallic silver base with fine silver glitter. The glitter in this reminds me of tinsel at Christmas! While Seraphina needed three coats to be opaque, I was still very happy with this color. I like that it's both metallic and glittery. It's so hard to find a unique silver shade these days, but Zoya certainly came through! 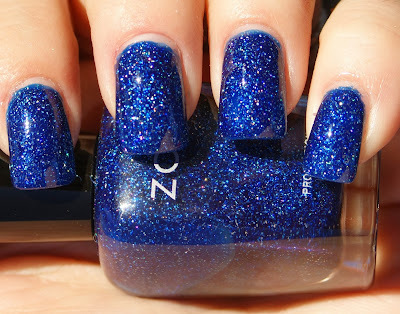 Here is Zoya Mosheen over Seraphina. Mosheen is a sky blue jelly base with bar and holographic glitter. It's very festive and a major improvement over last year's Electra. This makes for a very delicate frosty look. It's very pretty. Next up is Zoya Belinda. I LOVE how it has blue and purple shimmer in the sunlight. You all know I'm a sucker for purple and this is no exception! Mosheen really pops when layered over Belinda too! Here is Cassedy, a pine green foil polish. This is a very unique shade and it's perfect for fall and winter! Mosheen stands out nicely against Cassedy, but I don't think it's my favorite combo. But it is certainly pretty enough. Now, onto the scattered holo shades! Now this is Peyton... everyone say: Hi, Payton! Just kidding. Peyton is a beautiful cranberry scattered holo that was opaque in just two coats. Mosheen picks up the holo in Peyton very nicely and totally cranks it up to the next level. So gorgeous! And last, but far from least, is Zoya Dream. 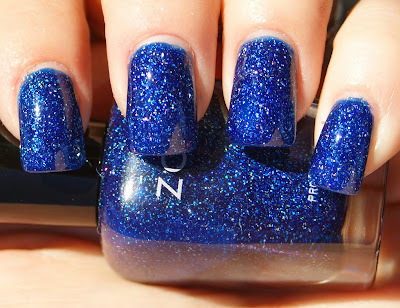 Dream is a scattered royal blue holo. And she is, by far, my favorite polish of the year. I have been talking about how much I wanted a bright blue scattered holo for years now. Then Zoya brings me this lovely gift and I just... I just can't. And Mosheen just picks up that holo sparkle and runs wild. I love it. I love it. I love it! Overall, I absolutely died over the shades from this collection. My top two are Dream and Peyton, obviously. Belinda is a close third. The entire Zenith collection is available at Zoya.com for $8 per bottle. You can also find Zoya at your local Ulta store. Are you going to be picking up any of the Zenith shades? And are you obsessed with these as much as I am? Dream & Peyton are my favorites too! Will definitely be getting them! Gorgeous swatches! Great swatches!! I like Mosheen a lot more than I thought I would after seeing these! I LOVE Dream and Payton, but they are all GORGEOUS! I'm wearing Belinda at the moment! Can't wait to try out the rest of the collection. Beautiful swatches! I love that you layered the glitter topper over the holos too...so fun! I've had Dream, Peyton, and Mosheen for a little while now, and I love all three! Will definitely be experimenting with Mosheen and wearing all three this Fall!! Great swatches!